Earlier this year, Gallery 1988 in Los Angeles, CA debuted a new art show called Postcard Correspondence. At the show, over 100 artists created designs for postcards from iconic/pop culture film locations (such as Hill Valley from Back to the Future, Cybertron from Transformers and Walley World from National Lampoon’s Vacation) as if they were real places to visit. This fantastic Up inspired "Welcome to Paradise Falls" postcard, by artist Bruce Yan, was one of the many amazing postcards featured there at the show. And if the design wasn't cool enough, it's also a limited edition of only 100 made - mine is numbered 84 on the back! That makes this a great piece for collectors like myself. I absolutely love the colorful art that Yan created here for this. 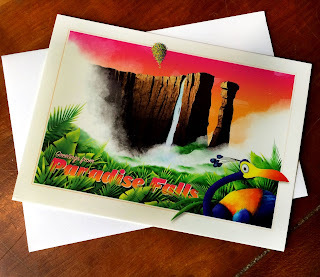 Kevin, Paradise Falls, Carl's house, the sunset, and even the typography...it all looks stunning and captures the film beautifully! 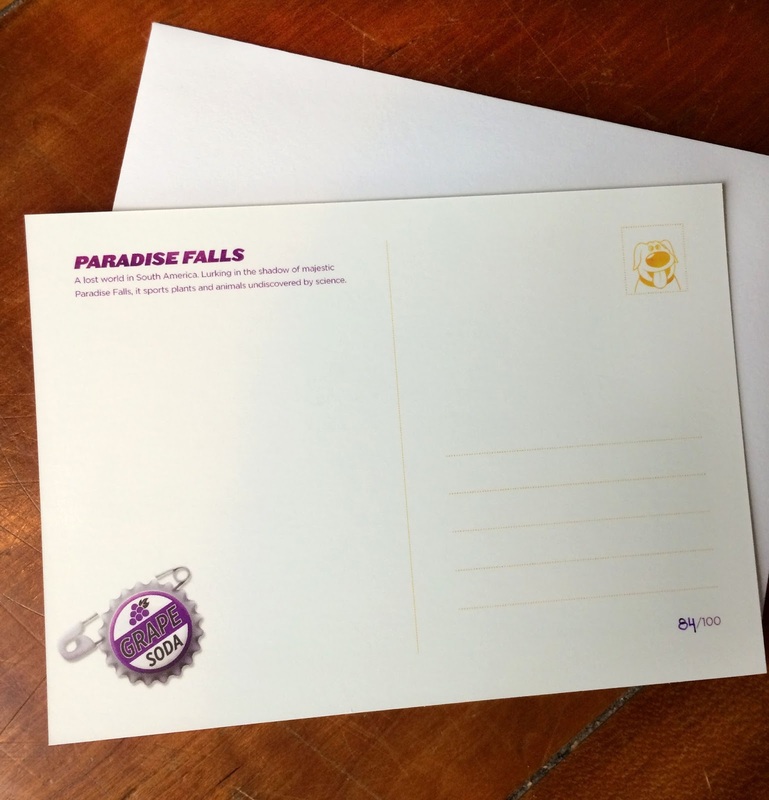 It's a standard postcard size of 5.83" x 4.13"and is printed on heavy weight paper. It's hard to tell from my picture, but it also has a gorgeous glossy finish. 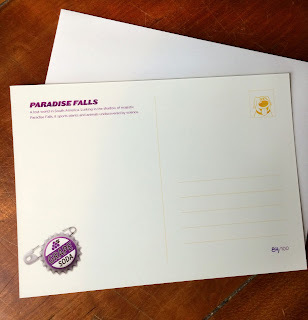 On the back you'll find the words, "Paradise Falls: A lost world in South America. Lurking in the shadow of the majestic Paradise Falls, it sports plants and animals undiscovered by science." as well as little images of Dug and the instantly recognizable grape soda pin (aka the Ellie Badge). Though it seems this would have sold out at the show, I found this postcard on the Gallery 1988 website for sale (and it appears to be in stock, though I question that since only 100 were made). Check out the site HERE if you're interested in snagging one of these for your collection before they sell out! A HUGE thanks to my great friends Steve and Sarah (of Media Meltdown Mousecast) who handed this little surprise over to me recently. That was super thoughtful and generous of them to hook me up like that...it's an absolutely fantastic piece!